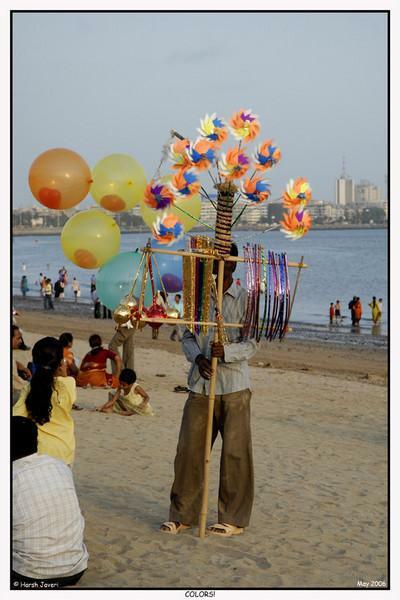 Vendor at Chopwatty beach, Mumbai. Shot in May 2006 while getting to grips with Nikon D200 and 18-70 lens. Dave commented on it in the gallery and that prompted me to share it in the dailies. Thanks Dave! neat shot, love how you can barely make out the vendor's face behind his wares, like he wants to hide behind his colors ! Love all the fun goodies. Nice picture. Fun shot. Love these view of India you share with us. BTW- Did you see my answer to your question about how I like the G9? I really love it. It is more than just a back-up camera for me. I love my slr's, but the G9 is just great!